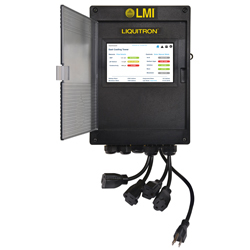 The Liquitron 7000 Series controller provides multiparameter monitoring and control for metering pumps used in boiler feed, cooling tower, industrial and municipal water treatment applications. The controller features a 7-in. full-color touch screen and an intuitive user interface. The 7500 model is equipped with an embedded 4G/LTE cellular modem for connection to LMI Connect, smart monitoring services.